From Goodreads ~ When Andrew Peacock made the move from Ontario to Newfoundland, he thought he was kicking off his career as a newly qualified veterinarian with an adventure in a temporary location. It was certainly an adventure - a whole series of adventures - but there was nothing temporary about it. He practiced in Newfoundland for nearly 30 years and is still living there. In fact, he has lived there so long, the locals are starting to think of him as one of them. 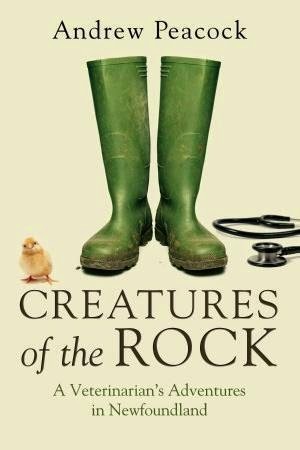 "Creatures of the Rock" chronicals a career spent working with and getting to know a rich variety of animals and their owners, on farms, in homes and in the wild. Andrew was the only vet for miles around. A day of practice could include anything from a Caesarian section on a cow in a blizzard to freeing a humpback whale from a trap designed for cod to capturing a polar bear after its surprise visit to a bingo parlor. And, on the human side, anything from trying to impress a surprisingly large audience of farmers with your first boar castration, to taking care of a family just as well as its stricken cat, to discouraging farm hands from helping themselves to hypodermic needles. All this against the background of a domestic scene in which Andrew's wife, Ingrid - also freshly qualified, as a doctor - shares the adventure of making a new life, and in due course of starting a family. Told in a series of brief, endlessly engaging stories, "Creatures of the Rock" is a funny, thrilling, unflinching but ultimately heartwarming narrative about the connections between people and animals, and people with each other. In the early 1980s, the author graduated from vet school in Guelph, ON, and accepted a job in Newfoundland. Part of his contract was that he had to agree to stay for two years ... and he's still there! This book is a compilation of his experiences which include rescuing a whale caught in a fishing net, castrating cows and pigs, transporting an orphaned baby moose in the passenger seat of his truck, etc. Rather than serving his promised two years and moving back to Ontario, he and his wife, Ingrid (who was a doctor) found the house of their dreams in Freshwater and raised their children. The book is reminiscent of the stories of James Herriot (which I enjoyed) but set in Newfoundland. The colourful flavour and accents of the locals come through. I liked the writing style. I felt liked I was sitting and having a cup of tea with the author and having a chat. The stories were interesting and funny. He's been lucky to have lots of crazy experiences. It's obvious he loves what he does and loves Newfoundland. There are pictures at the end to give you a taste of what his life was like. This sounds like a good one. I'm always looking for more books to read that are set in Newfoundland (and Canada too for that matter). That does sound fascinating! A different perspective of Newfoundland that even most of us Newfoundlanders would be familiar with.